I recently saw this silly little movie and it was great. I mean, is there anything better than George Clooney as a hen hungry fox, looking to break away from his safe and settled life and back into his wild ways of the past? Nope, I love Clooney, I can’t help it. So after watching some Clooney/cartoony magic I was particularly smitten with Kynna’s latest project: a Fantastic Fox of her very own. It’s adorable! I have only seen it in person while it was in progress but it was adorable even then. 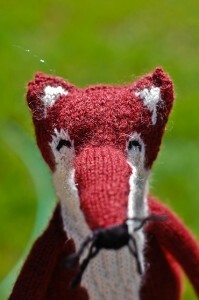 Another great toy knit from Interweave Knits Magazine. Knitting mags are so much fun, there is usually a wide assortment of patterns as well as some interesting knitterly tidbits to peruse. 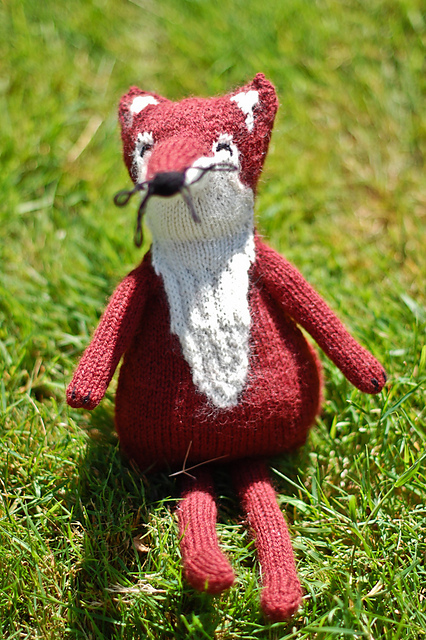 This Fantastic Fox was made with Classic Elite Fresco, a soft yarn in just the right foxy colour. Pick up a mag and a couple of skeins and make yourself a little foxy of your very own. This entry was posted on Friday, August 19th, 2011 at 10:04 pm	and is filed under Uncategorized. You can follow any responses to this entry through the RSS 2.0 feed. Both comments and pings are currently closed. tee hee! It put a smile on my face to see my little friend on the blog He needs some clothes now!